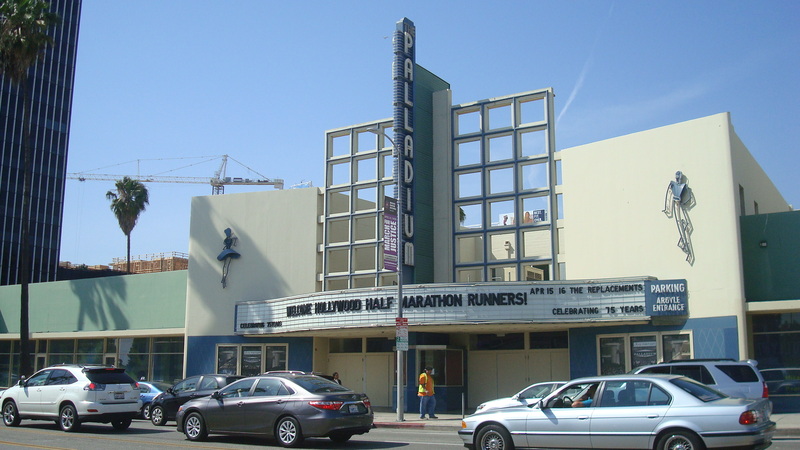 The Palladium, with Columbia Square rising in the background. 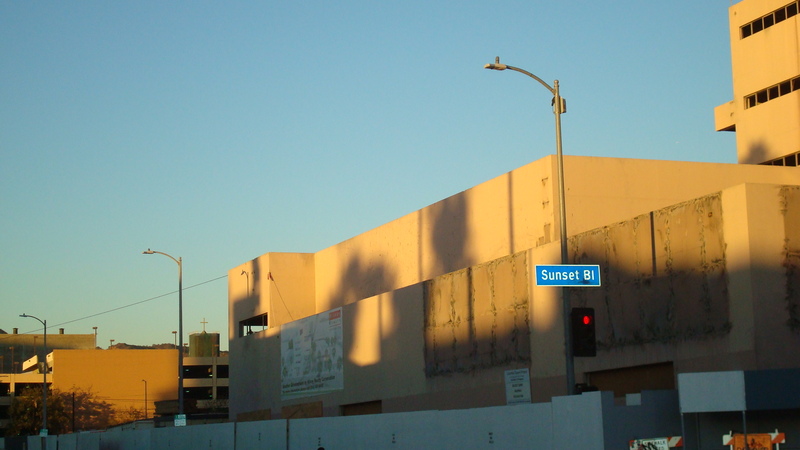 There’s a hearing at City Hall this Wednesday on a project proposed for the site surrounding the Palladium on Sunset. The project is called Palladium Residences, and there are two ways it could go. Either 731 residential units, or 598 residential units and a 250 room hotel. Both options include 24,000 sq. ft. of retail and restaurant space. My question is, where is the water for this going to come from? I think by now everybody in LA knows there’s a drought going on. In fact, an extreme drought. Gov. Brown has declared a drought state of emergency and soon the Metropolitan Water District will be cutting deliveries to its Southern California customers, including Los Angeles. Angelenos have already been asked to voluntarily cut their water consumption by 20%, but the move by the MWD means we have no choice. So let’s look at the Palladium project in this context. How will it impact water usage in the Hollywood area? First, in its current state, the site needs very little water. Aside from the Palladium, it’s pretty much all parking lot, so unless there’s a show going on, consumption is zero. Whatever the developer builds, it’s going to cause a large increase in water usage. Even if we assume that the project will be built utilizing every water conservation measure imaginable, we’re probably looking at a net increase of between 100 and 200 acre feet per year. But that’s just looking at the Palladium Residences in isolation. 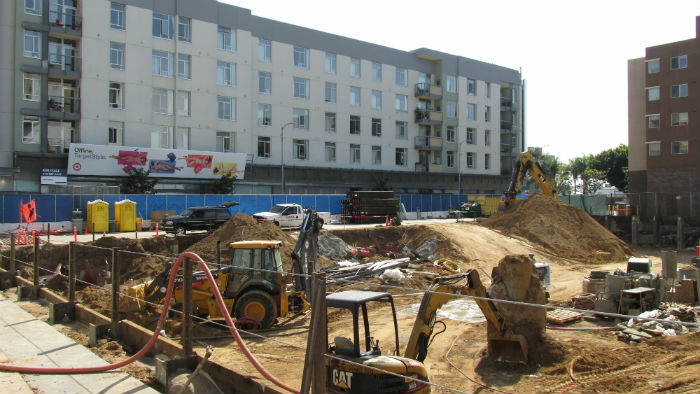 The site is surrounded by a number of other projects that are already under construction. Right next door, we have Columbia Square, which includes 200 residential units, over 400,000 sq. ft. of office space and 30,000 sq. ft. of retail. 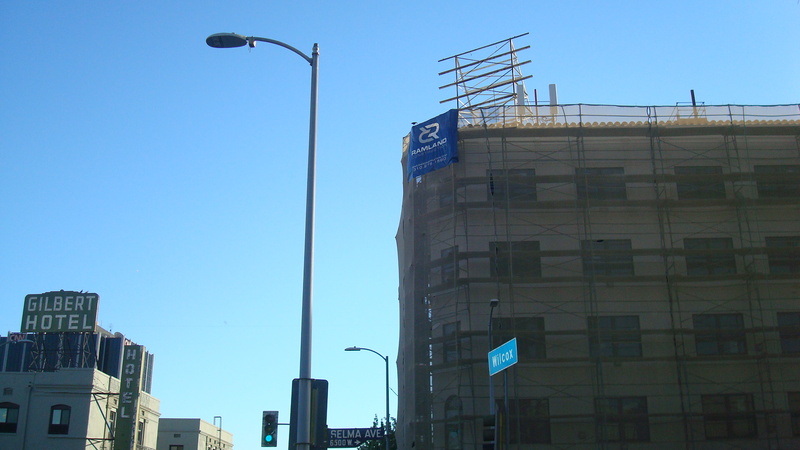 On the opposite side and just to the north the new Camden is going up, offering 287 rooms. Just across the street from that is 1601 Vine, an 8-story office building. Relatively speaking, office space doesn’t require a lot of water, but since the site was previously a parking lot, there will still be a net increase in water use. A couple blocks to the west, the new 182-room Dream Hotel is rising over Selma. And just beyond that is the Mama Shelter Hotel, with 70 rooms, which will occupy a building that was previously vacant. Remember, all of these projects are being built on sites that previously consumed little or no water. It’s important to say, too, that all these hotels will have at least two restaurants, and will be hosting banquets, which drives water use way up. So putting all this together, conservatively speaking, we’ll probably see a net usage increase of at least 500 acre feet of water per year. But wait. There’s more. Aside from the projects I’ve already mentioned, there are around 60 others proposed for the Hollywood area, many of them just as large as the ones listed above. So we’re not just talking about 500 additional acre feet of water per year. We’re talking thousands more. And that’s just Hollywood. If you look at Downtown, you’ll see a similar number of projects, some of them way bigger than anything proposed for Hollywood. There are also plans for major developments for Wilshire Blvd., the Crenshaw District and Boyle Heights. I’m not saying we should put a halt to development. But we do need to figure out how much development we can actually support. 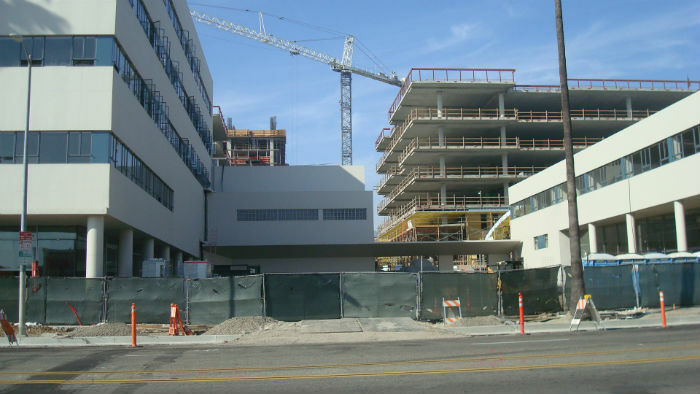 The DWP says that LA is in fairly good shape in the near term, but they’re only looking a couple of years ahead. Some scientists think this drought could last for several more years. By now everybody who lives in California knows that many of our reservoirs are at less than half of capacity, and the snow pack has shrunk to 6% of what’s normal for spring. The wells in the San Fernando Valley that we used to rely on have become contaminated, and it will take years before they’re cleaned up. We need to figure out a water budget. First the DWP needs to prepare a realistic estimate of how much water we can rely on for at least the next five years. Then the Department of City Planning needs to make sure they have solid numbers regarding the water that will be consumed by each proposed project. With that information, they can make a cumulative assessment of the impact all these projects will have on our water resources, and prioritize them based on how beneficial they’ll be to the community. Let’s get real. We don’t have the water to build all this stuff. Even if we have supplies to last for the next year or two, these projects will be consuming water for decades, and some scientists believe this drought could get much worse than it already is. We need to know how much water we can realistically count on, and then we need to plan accordingly. The Mayor has been telling us that we need to cut our water use by 20%, but at the same time he’s pushing this aggressive development agenda which is guaranteed to boost water consumption even as Angelenos are told they need to conserve. And let’s be honest. We haven’t made much progress in cutting our water use. Even with the threat of a massive drought, we’re using about as much water as we always have. So residential towers and high-rise hotels are just pushing us farther into the danger zone. We need development, but it has to be planned development. If the City of LA wants to grow, it needs to find out first how much water we have, and how much each of these projects is going to consume. Much of the reason we’re in trouble today is that for decades the City allowed massive growth without proper planning. We’ve been sucking up water from all over the Southwest to build a vast metropolis in an area that has very little water of its own. We can’t do that any more. We need to start living within our means. Another view of The Palladium, now with The Camden construction site in the background. 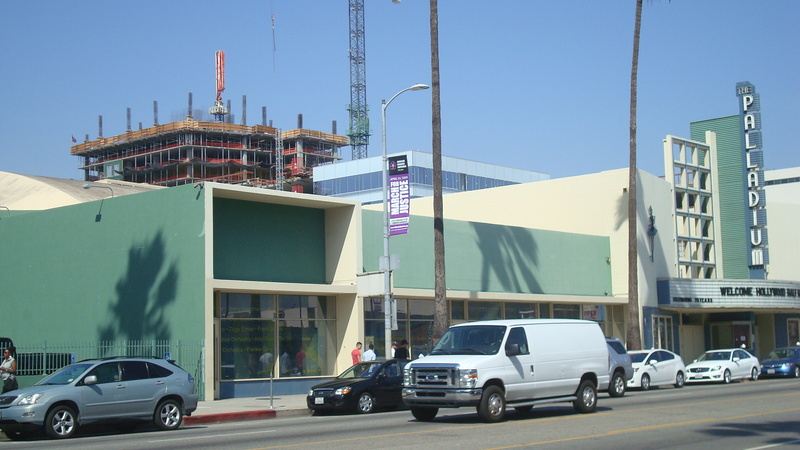 The new Emerson College campus on Sunset Blvd..
Sunset Boulevard is changing rapidly. 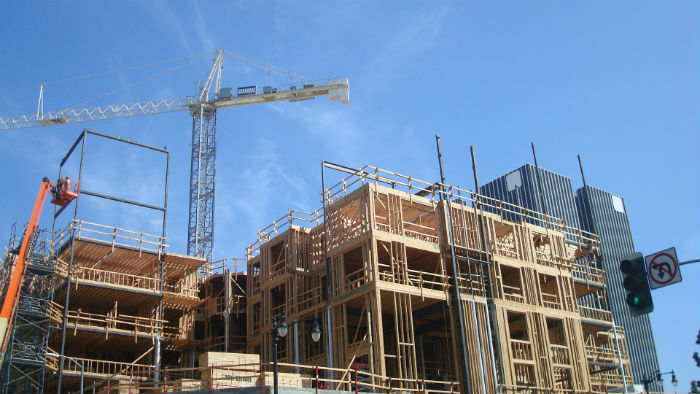 Developers sense there’s big money to be made, and the City Council is rushing to approve their wish lists with as much speed and as little oversight as possible. Let’s take a look at three projects that are in various stages of completion…. 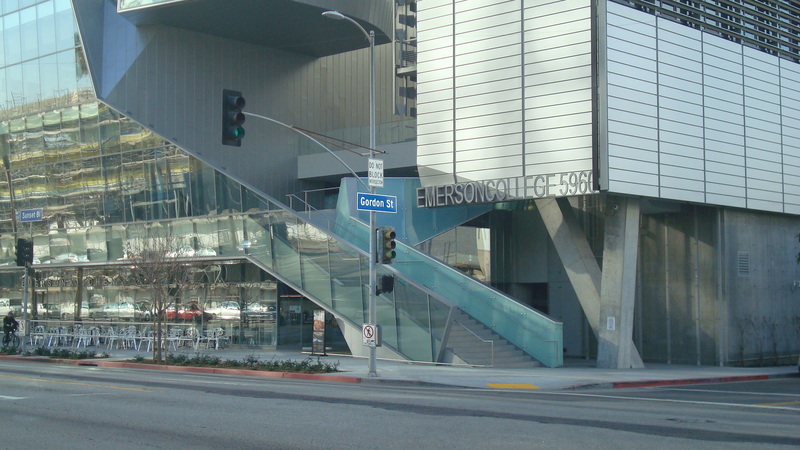 A view of the Emerson campus at street level. 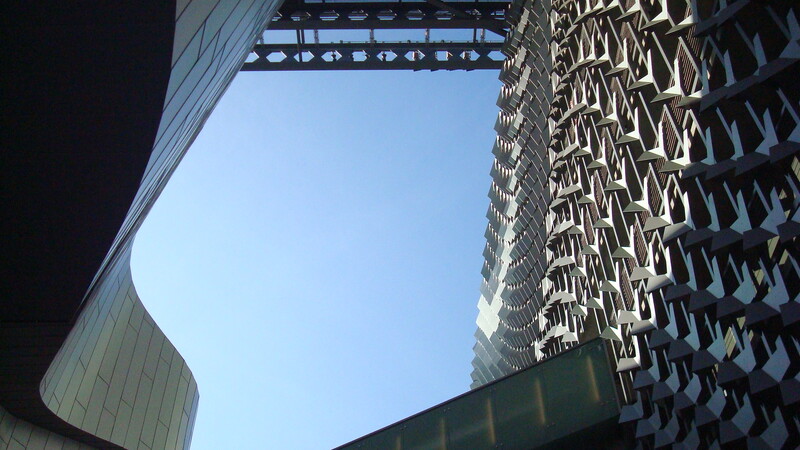 The most interesting of these projects, and in my view the one most likely to produce real benefits for the community, is Emerson College. The school’s new LA campus was designed by Morphosis, and while I’m not a huge fan of the firm’s approach, I have to say this is a nice piece of work. By far the most striking building on the streetscape, it certainly calls attention to itself, but without being ostentatious or garish. 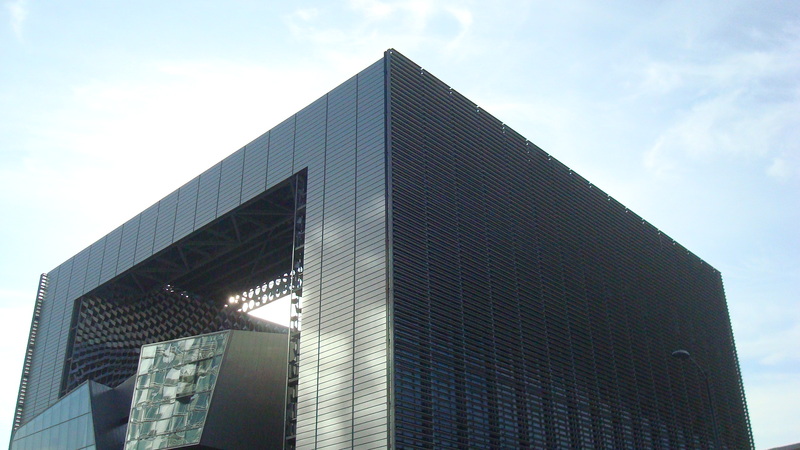 It’s a sophisticated modern structure that also manages to be playful. 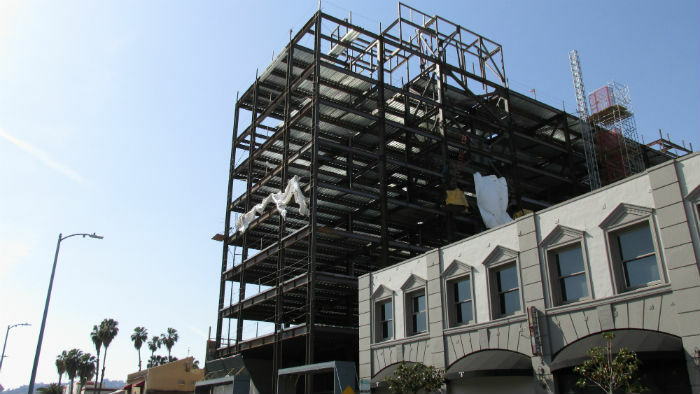 It’s been a while since anyone built anything this cool in the Hollywood area. A view from a terrace at the entrance to the campus. Also, Emerson will be bringing teaching and administrative jobs to the community. The City Council insists that development is necessary to reduce unemployment, which sounds logical, but most of the projects they approve will only create low-paying service sector jobs. They seem to feel Hollywood residents should be satisfied with waiting tables and vacuuming hotel rooms. Anyway, Emerson just opened in January and is located at the corner of Sunset and Gordon. A new residential/retail complex across from the Emerson campus. Right across the street is yet another mixed-use, residential/retail tower. This seems to be the kind of project that developers can’t get enough of right now, high-end housing combined with ground floor retail. By combining the two they can claim they’re addressing the traffic problem by making it easier for people to shop where they live. In reality, I don’t see any evidence that this approach is reducing congestion in the LA area. But there are plenty more projects like this in the works. At least this one looks kind of nice. The biggest thing going up on Sunset right now is Columbia Square, which will be a massive mixed-use project that incorporates the old CBS Studios. You probably won’t be surprised that it promises still more high-end housing with still more ground floor retail. They’re also billing it as “Hollywood’s New Creative Media Campus”. I’m not sure exactly what that means, but hopefully the finished product will deliver more than I expect. You can click here for more details. 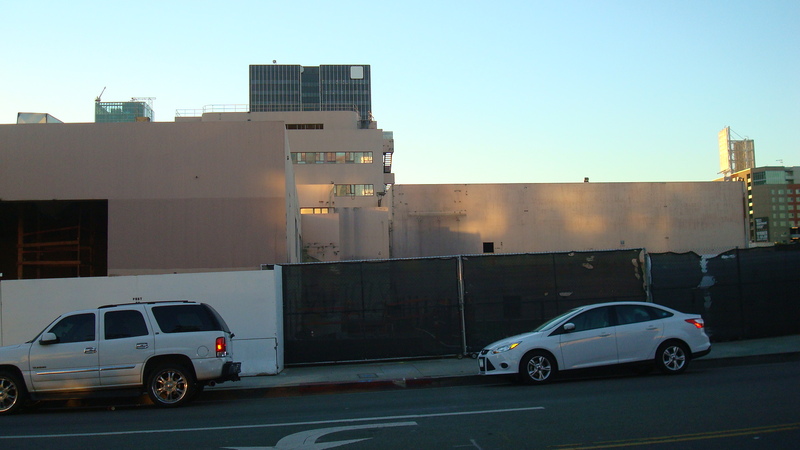 At least they’re preserving the CBS building, so I guess I should be thankful for that. To read more about the history of CBS Studios, click here. 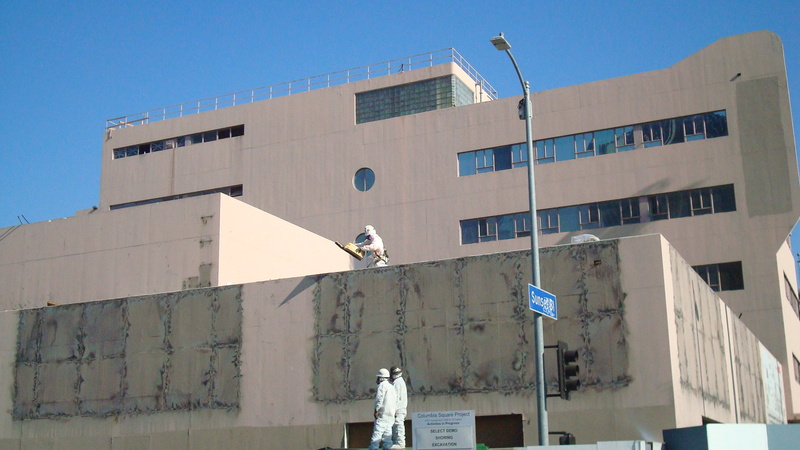 Workers atop the old CBS Studios. Columbia Square will occupy a full city block. 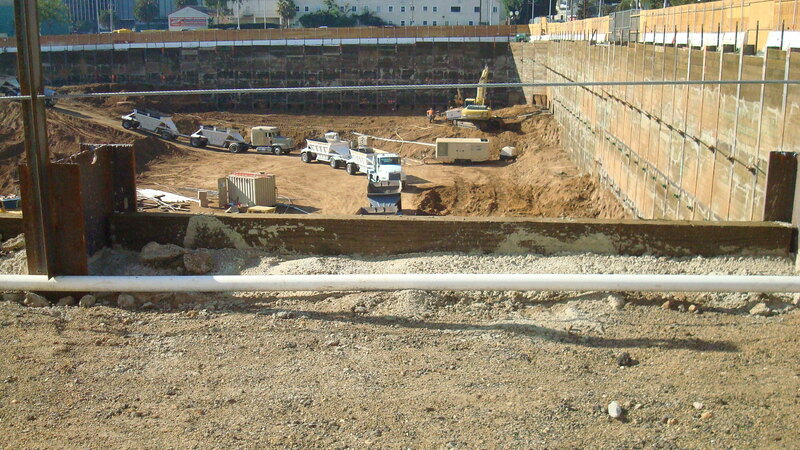 Right now workers are busy inside a massive excavation as they prepare the foundation. There’s something about the scale of these enormous projects that’s kind of overwhelming. I look down into this huge pit and see hundreds of workers, I see trucks, tractors and cranes. A whole city block is being transformed. Workers preparing the foundation for the Columbia Square project. 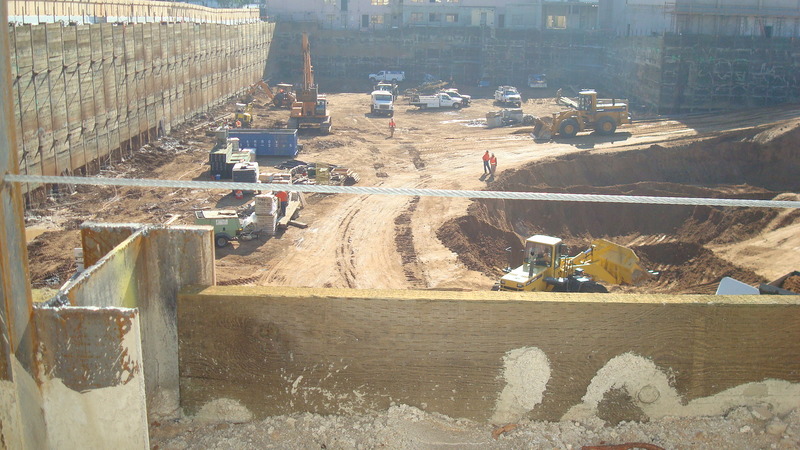 Another shot of workers preparing the foundation. Here are a few more images…. A side view of the site, facing west. Another side view, again facing west. 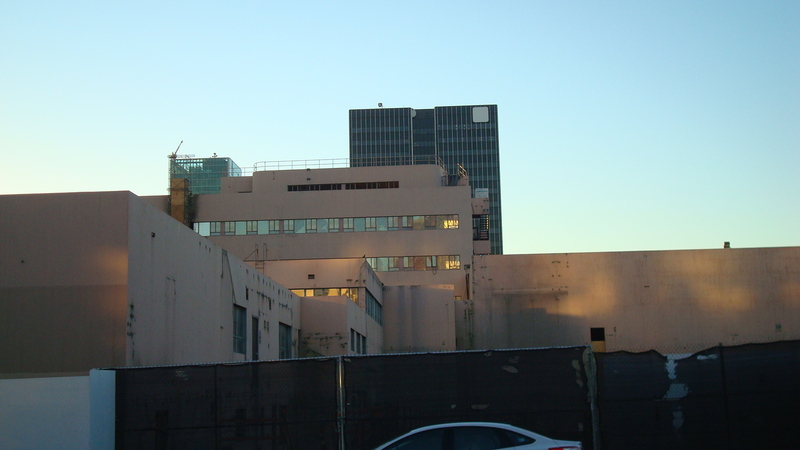 A shot of CBS Studios taken in the late afternoon. You may wonder why I included these, since they’re mostly shots of the sky above the project. It probably seems like just a lot of empty space. But that’s what I wanted to capture. 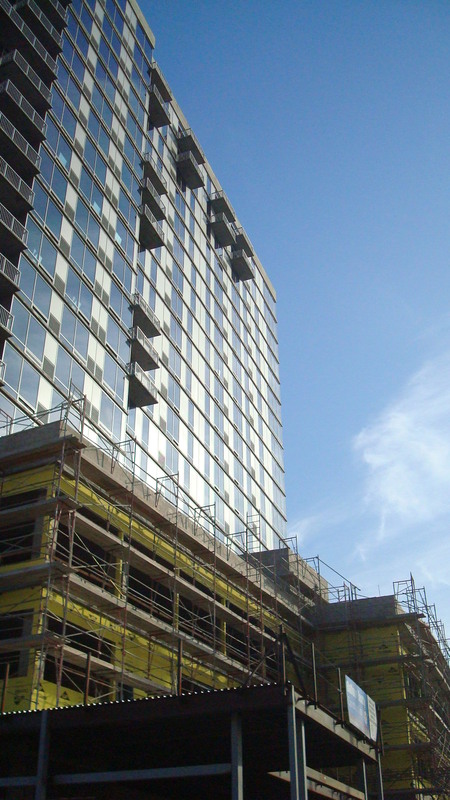 When Columbia Square is finished, it will rise twenty stories above street level. All this space will be gone.